Carta uses the Black-Scholes Option Pricing Model as the standard for valuing stock option awards. One of the main assumptions in the Black-Scholes Option Pricing Model is volatility, which serves as a measure of the risk or uncertainty in regards to the change in the value of a security. In other words, how the stock price fluctuates. Thus, in order to calculate the option value, a reasonable volatility assumption needs to be used. Due to the nature of private entities, often times there is insufficient data on historical stock prices, making it difficult to determine a reasonable historical volatility. For this reason, companies may consider using public peer company or an industry sector’s daily stock prices as a relevant estimate of volatility. As such, the expense accounting tool requires an input of the public peer companies to generate the expense reports. 1. 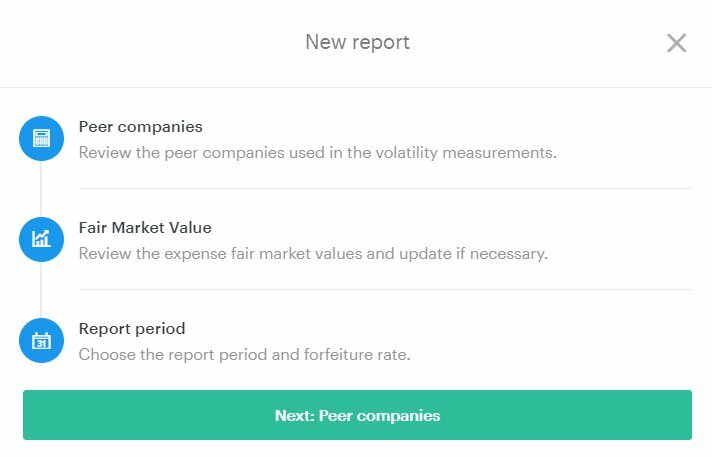 To select your peer companies, navigate to Expense accounting under Compliance. Then, click Create a new report. 3. Enter in your Public Peer Companies. We require a minimum of four unique peers. 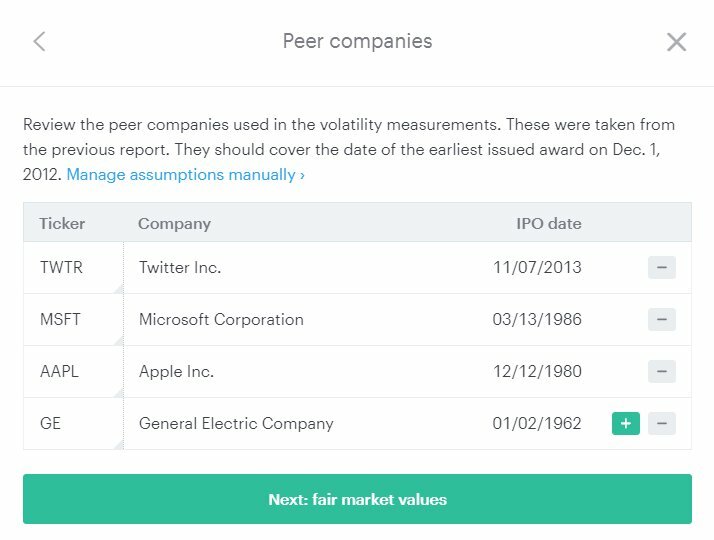 The peers that you select should have enough market data to cover the earliest award issued on your cap table. If you are unsure of your public peer companies, you may wish to use the companies listed in your 409a valuation. If you have not yet received a 409a valuation or your 409a provider did not provide a list of the public peer companies, you may wish to find business that are operating within the same industry, share a similar business model, or would be directly disrupted by the impact of your operations. Once this input is collected, Carta will calculate the volatility for each individual grant based on the grant’s expected term and issuance date. All historical daily pricing information is pulled from third-party data providers, Quandl and CapitalIQ.